Au Bord du Nil (On the Banks of the Nile), a sculpture by one of Egypt's most famous sculptors, Mahmoud Mokhtar, has been selected by Sotheby's auction house in London to be part of its “Islamic Week”, which will run from 15 to 21 April. The work is "the largest of its kind to appear at auction, an iconic testament to the father of modern Egyptian sculpture," the event's press release read. The piece dates from 1921 and is estimated by Sotheby's to be worth £120,000 -- £180,000. It represents an Egyptian peasant woman, the emblem of Egypt’s nationalist movement, who stands tall, poised to adjust her veil, revealing her feminine beauty whilst carrying out the menial but essential task of sourcing water from the Nile. 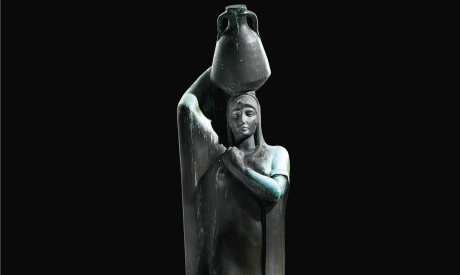 Another work by Mokhtar carying the same title (On the Banks of the Nile) and representing another peasant woman in a different pose carrying a water jar, was sold during December 2015 at auction. It had been estimated to reach £30,000 -- £40,000 but sold for £317,000, becoming the star piece of the auction. Born on 10 May 1891, Mokhtar grew up in a small village near Mahalla, where his father served as the omda, or mayor. He moved to Cairo to pursue artistic studies and was among the first to study sculpture at Cairo University's fine arts faculty. He later continued his academic work, supported by Prince Kamal Youssef, at Paris' Ecole des Beaux Arts. Mokhtar went on to become one of contemporary Egypt's most celebrated sculptors. In1962, the culture ministry opened a museum in Cairo bearing his name and displaying many of his works. Mokhtar's other iconic sculptures include a statue of Egyptian nationalist Saad Zaghloul and an image from the Egyptian revolution; the first located in front of Cairo's Qasr Al-Nil Bridge and the second in the coastal city of Alexandria.